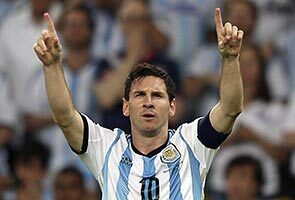 Lionel Messi and his Argentina squad play Iran on Saturday in the 2014 World Cup group stage. Argentina's tactical approach will be in the spotlight against Iran on Saturday, with captain Lionel Messi eyeing a more attacking system. Alejandro Sabella's side opened their FIFA World Cup campaign with a battling 2-1 win over Bosnia-Herzegovina, during which they deployed a 5-3-2 formation. That moved Messi into a deeper position, supporting Sergio Aguero, but after the game, the Barcelona star expressed his displeasure at the tactics deployed by Sabella. "We are Argentina," Messi told reporters. "We shouldn't be looking at how our rivals play. All I care about is that we play well. I prefer 4-3-3 and I feel more comfortable with more players further forward." The comments have unsurprisingly led to many hinting at a rift between the skipper and coach Sabella. Mariano Andujar, Argentina's reserve goalkeeper, was quick to rubbish those rumours, saying: "He (Messi) gave his opinion, like many others did. And that's it. There is no problem. Everyone is free to have their opinion." Their win over Bosnia means Argentina will head to Estadio Mineirao knowing three points will leave them almost assured of a spot in the next phase. Standing in their way, though, is a foe Sabella's men are acutely aware will try to make life as difficult as possible. "All of the matches have their difficulties and it’s our job to overcome them," said goalkeeper Agustin Orion. Messi certainly played his part in Argentina's first game, grabbing what would ultimately prove a decisive second goal and taking his international tally to 39 in 87 appearances. He and his stellar support cast could face a tricky task after a dogged display earned Carlos Querioz's men a goalless draw versus Nigeria in their opening Group F fixture. Although the challenge of going head to head with Argentina is sure to provide a greater challenge of a backline that was so impressive against the Africa Cup of Nations champions, they remain confident. "It was a tough match," said forward Reza Ghoochannejhad. "We knew they were a physically strong team, but that didn't stop us putting in a good performance. "We pressed them constantly and our tactics nullified their game." The sides have met just once previously, in a four-team tournament celebrating Real Madrid's 75th anniversary.